I found these Jet-Puffed Cinnamon Bun marshmallows at Target and thought they would be great. 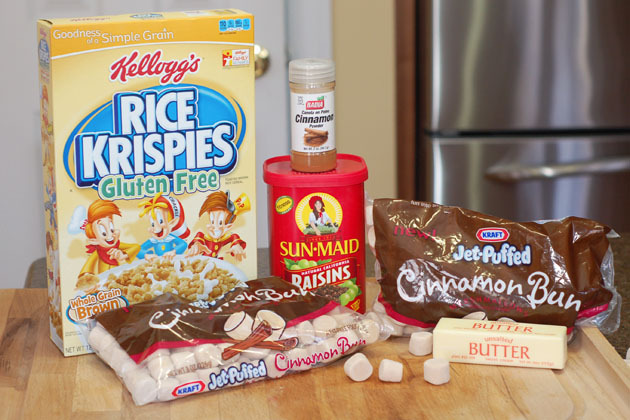 The cinnamon flavor in the marshmallows is very subtle, so I added ground cinnamon also. You can leave them plain like this or add a glaze like I did. 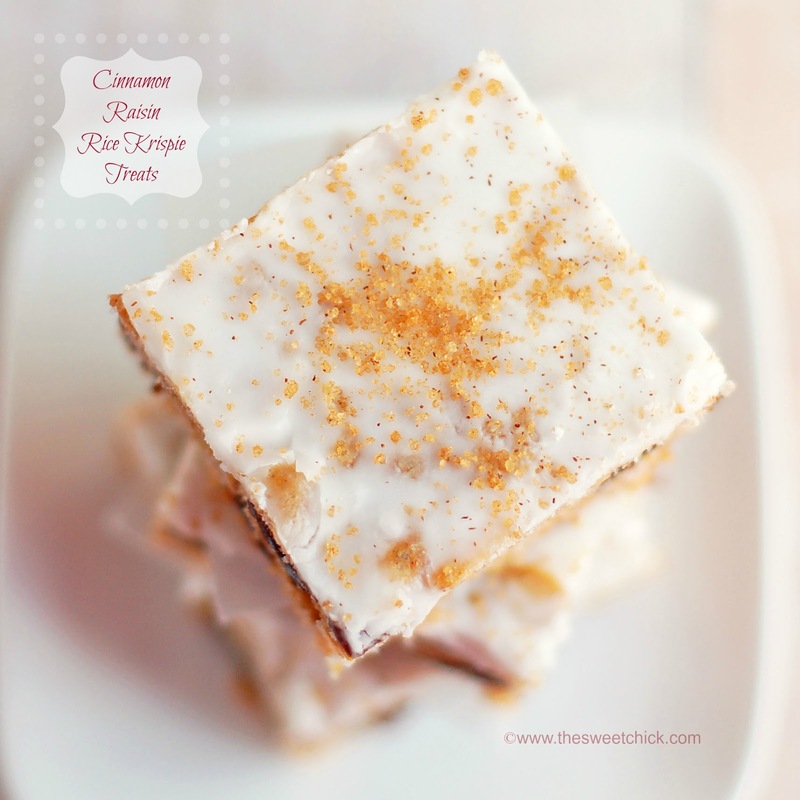 I even added a sprinkling of cinnamon sugar, because I just can't get enough of cinnamon. 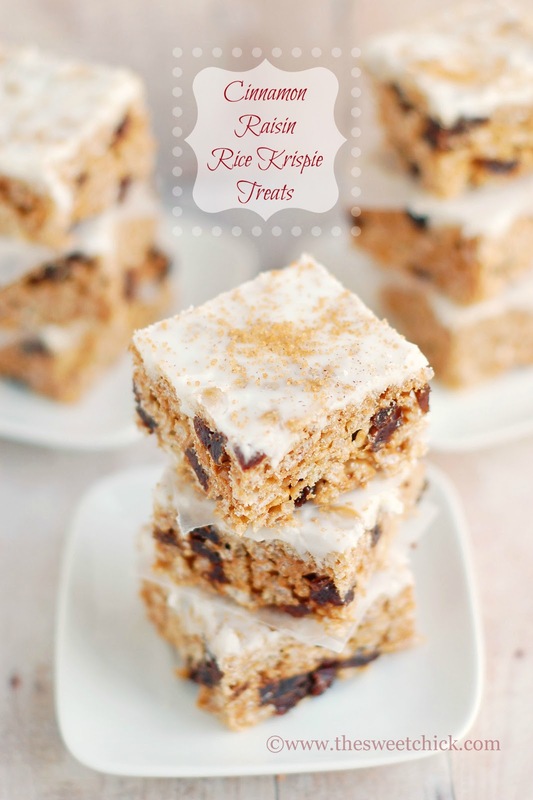 Just look at those beautiful chunks of raisins surrounded by all those cinnamon goodness and krispie crunchiness. For all of you in the path of Blizzard Charlotte/Storm Nemo, stay cozy and warm in your homes and try to stay off the streets. Be safe! Remove from heat and add cinnamon and vanilla. Stir until completely mixed. Then add the Rice Krispie cereal and the raisins. Mix until all is well incorporated. In a small bowl mix the sugar, milk and crisco until smooth. Pour over the treats and spread evenly with a spatula. Before the glaze hardens, sprinkle the cinnamon sugar on top. Then sprinkle over the treats. Put as little as or as much as you desire. Once the glaze sets, cut into squares and eat! I love oatmeal raisin cookies too! I tried those marshmallows a couple of months ago and they were good. 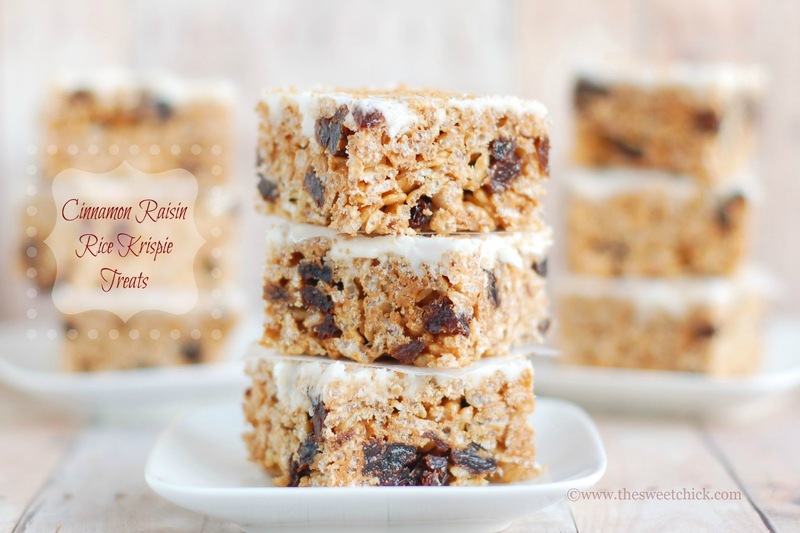 I bet they were good with the raisins and rice krispies :) Have a wonderful weekend! Haven't made rice krispie treats for awhile. Yum. I'll have to put the cinnamon bun marshmallows on my list. Hope you made it through the storm ok. My daugther lives in Boston so I've seen a few photos she has sent. Thank you. The amount of snow here is ridiculous. Most side streets were not plowed. My husband snow blowed us out of our street so I could take the kids to my mom while he tried to fix our broken furnace. Now all is almost back to normal, except for the wintry mix we are getting this morning.